Royce weighed 88 kgs. Yoshida weighed 100.6. kg. according to the official ring announcement. Yoshida said in an interview two days later that he had weighed 102. kg. Royce probably weighed a few kg. more as well. The weight difference was therefore about 12 kg., approximately the same as between Kimura and Helio 51 years earlier. Royce wanted the fight to be grappling only, in order to better pay tribute to his father's October 23, 1951 match with Kimura and also, Royce said, to ease Yoshida's entry into MMA. Pride had different ideas about what the fans wanted to see and planned to toss Yoshida into the deep end of the pool for a baptism of fire (so to speak). As it turned out, no punches, kicks, knees, elbows, or head-butts were thrown, other than two tentative step kicks that Royce used to set up his guard-pull. So it was a submission grappling match after all, with kimonos, just like Helio and Kimura's match in 1951. There was a major difference though and it was a difference that became the origin of a legend, myth, mystery, and even academic blunders. Helio, it is said by his grandsons and fans, invented a unique way of fighting, using his legs, in order to beat larger, stronger opponents. Kimura vs. Helio surely would have been the perfect time to put his unique fighting style into action. But Helio did not pull guard in the first round of his fight with Kimura. Kimura did not attempt to take Helio to the ground and finish him there in the first round. Kimura explained exactly why he did what he did (Choque 2, chp. 2), which makes it implausible that Kimura said he would recognize Helio as the winner if he lasted 3 minutes (as Helio and Rorion have insisted). But it does possibly explain why Helio did not pull guard in the first round (he did, or at least he tried, in the second round but Kimura jumped over Helio's leg and Helio never recovered his guard after that). If Helio wanted to survive as long as possible, the best way he could try to accomplish that was to let Kimura throw him, or rather, not do the only thing he could possibly do to avoid it, which was to sit down or pull guard. Helio had a personal and idiosyncratic view of what it takes to win a fight, a view currently being promoted by his grandsons Ryron and Rener (but not Rickson). That view is "Not losing = winning". Helio planned to beat Kimura by not losing and the only way he could do that was to avoid going to the ground as long as possible and then hope for a draw. It didn't work out that way, but it made a lot more sense than Japan's plan to defeat America in World War 2, and had a better chance of succeeding. Royce agreed with his father (see Part 1) that any win is a good win, but he apparently didn't agree that not losing = winning. At least, he knew that the promoters and fans didn't think so. If he avoided losing, it was going to be ruled a draw, not a win for Gracie Jiu-Jitsu. As Mr. Morishita explains below (read the note too), fans like action, and promoters like what fans like. Royce took the fight to Yoshida, but judiciously. Kimura intended to throw Helio around the ring for one round to put on a judo show for his Japanese fans in Brazil (who were very upset about Kato's loss to Helio the month before). Kimura was well aware that he wasn't going to KO Helio with a throw on a soft surface. When he decided to take Helio to the ground and keep him there, that is exactly what he did. Royce however did not think that Yoshida intended to put on a 10 minute judo show before beginning mat work. Yoshida planned to enter into ne-waza from a throw (as he explains below). So Royce wisely took the initiative. The rest is history (read below). Royce officially "lost" at 7:24 of the first round by what was ruled a "失神" KO [失神 means loss of consciousness]. Royce denied that he lost either consciousness or the fight. The Gracie Train was incensed. Chaos ensued, followed by controversy. Among the post-fight reactions were Helio, Pedro Valente Jr., Royce (reluctantly), Yoshida, and various sports writers. Above: Under a clear night sky on a fine day on August 28, 2002, the advent of a new pro wrestling. Above: Captions read (left side) "I didn't lose" (top) Yoshida, "crushing victory" (right, side) "you should know this man!" (center) "The sun eclipses the moon by overwhelming victory...the birthday of a new breed of MMA hero". Note: The interview took place after the fight and was published in SRSDX September 26, 2002, p. 10. As the caption above Helio's picture indicates, Royce was unable or unwilling to be present at the post-fight 会見場 [press conference]. Helio spoke in place of Royce. Royce commented later, here. Helio: First, I want to say something. In my opinion, the fight didn't happen. Concerning the referee in this match, I think he didn't have the authority to stop it. It is extremely regrettable that he stopped the match. I think it was really unfair. I understand that not everyone in Japan agrees with his action. Because I really respect Japanese people I never thought such a thing would happen. I'm sure everyone in Japan doesn't agree with the referee's action. I would like this contest to be declared a "no contest" [ノーコンテスト ] and for that reason I asked the promoters to declare this fight a "no contest". I want to be clear on this point. And also, I think I would like for there to be a new match. This isn't a "revenge" match, it will be a new match. Question: Did you have some agreement about the referee before the match? Helio: Concerning the rules, we clearly discussed the fact that there wouldn't be any referee stops. Only the fighters' "seconds" would be permitted to stop the match. That was firmly stipulated in the contract. Question: Are you saying that the match could only be stopped by "throwing in a towel"
Helio: Yes. That's right. The only one who can stop the match is us. Question: What do you think about Yoshida's judo technique? Helio: Concerning Yoshida, from before the match it was understood that he was said to be a great athlete, and it was known that he was a world judo champion. So in that way [we] respected him. Question: If the referee hadn't stopped the match, what do you think would have happened (how would the match have gone)? Helio:　That's not something that I can know. It is a pity that it wasn't allowed to continue [because then we would know]. Personally, I wanted my son to win. The Gracie family, that always haggles over the rules, did it again, creating a ruckus before the tournament. After the tournament too, they created an uproar. But this time, the Gracies were right. Because in the rules discussion it was agreed that if a fighter doesn't tap out, the referee has no authority to stop the fight. 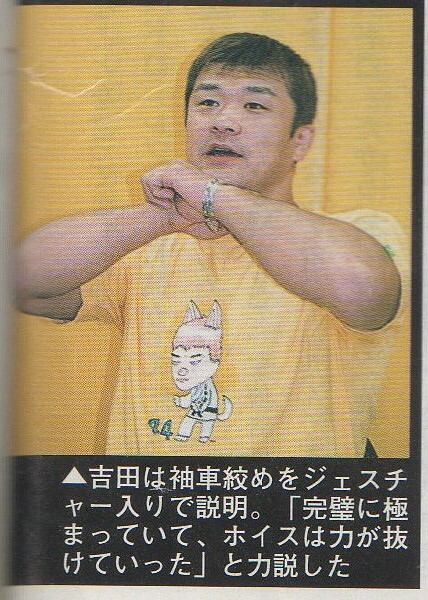 Nevertheless, Mr. Noguchi, who served as the referee in this match, ruled that Royce lost unconsciousness [失神した] by Yoshida's sleeve-wheel-choke [袖車締め]. And he suddenly stopped the fight. Royce might have been slightly out [浅く落ちていたかもしれない] or not at all out. It isn't possible to know from watching the tape. But immediately after the fight was stopped, Royce stood up without assistance and protested that he hadn't been out. To no surprise, chaos broke out. Royce, his face red with anger, jumped in front of Noguchi (the referee) and threw several punches. The ring was a mob scene. The Gracie Train, while not lacking a reason to be angry, nevertheless improperly interfered by jumping into the ring. After the fight was over, they apologized for their violent behavior and then registered an official protest. Certainly, Yoshida had a complete advantage during the match. But it is possible to think that if the rules had been followed correctly, the situation might have changed, so in that sense the Gracies weren't wrong. In any case, it can't be denied that Noguchi's action exceeded his authority as referee, even if he believed that he needed to step in to protect Royce from serious injury. Ishii-Kanchô accepted the Gracie's protest and promised to review the case within two weeks. I wonder what will happen after two weeks? Q: The fight is over. Can you share your honest opinion about it. Yoshida: Well, you can say I'm relieved. But there is a bad after-taste. Q: What was Royce's condition after the fight? Yoshida: His strength was gone. The choke was completely in. I thought, maybe he was unconscious and couldn't even tap out. I was sure he was unconscious. I mean, I thought he was unconscious. I knew his strength was completely gone. Because at the end, I felt no resistance. Q: Before the fight did you feel some kind of fear? Yoshida: If I said I didn't I would be lying but.....Excuse me [Yoshida's cell phone rings]. Q: Royce is insisting that the fight was invalid. Yoshida: Is that a fact? Well, that posture another degree (laughs). Q: Do you plan to agree if another match is needed? Yoshida: It's ok with me but truthfully speaking I'm ok with the result as it is. Q: That technique you used, what is that called in judo? Yoshida: It is "sleeve wheel"”袖車です。どうちかと言うと柔術ですよね”]. Q: Did you practice ne-waza pretty much in your judo days? Yoshida: In my judo days, I didn't train ne-waza at all. It required a lot of energy. Q: Did you go for a heel hold? Yoshida: I thought it was in, you know. It was pretty difficult. Q. Did you train heel holds? Yoshida: Sort of. I started training with Tsuyoshi Kôsaka [高阪剛].It was enough to know how to escape. But I had to start from zero　We don't have leg submissions in judo. That was the main thing I studied, you know. Q: Were you able to attack as you thought? Yoshida: No. Really, I wanted to enter into ne-waza from a throw, but as I anticipated he grabbed both my sleeves and right away pulled guardｔ was just as a expected. It was the situation that I was expecting my opponent to to make. It happened before I could go for a throw. It is regrettable that I couldn't apply a throw. Q: You said "I'm confident" ["自信が出てきた"], but Royce, he is one of the "top class" in MMA. Did you mean you had strength [力], did you mean it in that way? Yoshida: No. This was a "jacket match". Matches wearing a jacket and matches without wearing a jacket are completely different. The rules are also totally different. I meant I had confidence in a jacket match. Q: Next time, you are going to fight wearing a jacket, you mean? Yoshida: I don't know if I'm going to fight again. I was relieved when this fight was finished, I haven't thought about it all what kind of fight the next one will be. Q: Was the reality of the ring completely different from what your image was before you climbed into it? Yoshida: I was surrounded by all my friends watching the watch so I felt good about that. For that reason I didn't feel any nervousness. But there was a lot of water in the ring and I was concerned that I might slip. Q: Was the mat different? Q: Was there a situation in the fight where you felt in danger? Yoshida: The first time when my leg was caught, was twisted, deviated but Royce pulled my gi and held it tightly I couldn't completely get my leg free. Well, but it didn't hurt. Q: On the contrary, you felt composed and calm. Yoshida:　No. I felt, what should I do? This is a problem. I couldn't decide what to do. It's a heel hold. Q: Does you victory feel different from when you were competing in judo? Yoshida: Well, this time, really, but more than happy, I feel relieved. After the first fight, I felt relaxed. But the next time, if there is a next time, I will feel less than this time. That's what I mean, you know. Q: Is there anyone who you want to fight? Yoshida: Nope. No one in particular. Q: Are you aware of the Kimura vs. Helio match? Yoshida: Nope. Not at all. Q: How does it feel to win this fight compared to winning a gold medal in the Olympics? Yoshida: Hmmm. That's a good one. Well, as you might expect, winning in the Olympics is really hard. You have to train hard to win. Well, this time I trained too, but winning the highest level of amateur fighting, the feeling, but this time, 10,000 people gathered to watch me win, so it was different, you know. Really, such a thing like happiness, in Olympics, National Stadium, a thing like easy mind. Honestly speaking, it's a relief. Q: Two days have passed since the fight. How do you feel? Yoshida: No, nothing special. Relived I think. I haven't changed my ordinary daily routine. Q: You returned to your normal life? Yoshida: Yesterday I went to the dojo to teach. At 2:00 I arrived there, did light running, then I taught the beginner kids. I was at the dojo until 9:00. I didn't change anything, almost. Q:　You feel readjusted already? Yoshida: Until now, I felt like I understand the level of my judo opponents, but this is a new world for me. I don't know how well it is going to work out. But I think I need to pay attention to the striking aspect as well as judo. I plan to train things that I never trained before. Q: Seriously, are you nervous before a fight? Yoshida: I'm always nervous before a fight, well, but I forget about it when the time to compete comes. Q: Yesterday, Mr. Helio said that you didn't do anything wrong, but that it was the error of the referee and judge and therefore he wants the result to be called a "no contest" [ 無効試合]. What about that? Yoshida: Well, not much about it.. The fight is over and I don't want to say anything about it. It's up to the organizers to sort out. I'll do everything I have to do. That's all I have to say about it....Royce was out, wasn't he? Q: Did you see the video? Yoshida: I didn't see it. Q: Out.....you felt that he was out, didn't you. Yoshida: His power was gone. I thought he was out. Q: You had a strong feeling that he was out? Q:　But you couldn't see around Royce's head. Q: From his breathing, you could sense that he was out? Yoshida: His power was gone. He was out. [力がなくなったんで、落ちたかなというのはありましたね]. Q: Until then, you could feel his power? Yoshida: At first, I was on top, and his arm, and choking [Royce]. And the, it [his power] slipped away [こうなって抜けて] 。It was in, completely in. Q: So on reflection, you told the referee "He's out, he's out" ["落ちた、落ちた"]? Yoshida: No. What I said was "Is he out?" [”落ちたんじゃないの？” ]. Because I couldn't see. I don't want to kill anyone. (said with a bitter smile [苦笑]). I couldn't see what was happening. The referee was the only one who could see what was happening. I had to rely on his judgment. I could have continued [choking Royce], but I though the referee was in the best position to decide. I knew his [Royce] power was gone. I was wondering what was going on. .Q: So you're personally OK with the result? Yoshida: A fight is a fight. It is what it is, you know. If some says that the result is unconvincing, then it is the organizers' responsibility to do something about it. Looking at this time, something is good, can do to this level it's good. Up to now, I don't know about that. Judo is different. In a judo match you fight your own fight. I think that's the best way, you know. In this match (with Royce) it leaves a bad after-taste [後味が悪いです ]. I mean, well, after thinking it over slowly, the organizers have to deal with it. Q: Just before, the rules were all confused, weren't you concerned about that? Yoshida: Umm, not really. It wasn't talked about what kind of rules, I didn't care about it. Q: This was the first time with striking rules. Yoshida:　Not getting hit in the face, me too, wasn't easy to do. Well, it's necessary to react to the opponent, I think. Q: Did the match go as you expected? Yoshida: As I expected......I think so. I thought he would probably pull guard as soon as we made contact. I expected that and trained for it. As soon as we made contact I could know my opponent's strength. So I wasn't afraid. Q: There's talk that DSE president Mr. Morishita, is considering putting you in as Takada Nobuhiko's opponent for his retirement fight, possibly next November in Tokyo Dome. What about that? Yoshida: I haven't heard about that but I'm a professional so I will do what I have to do with a positive attitude, but also considering the rules, you know. 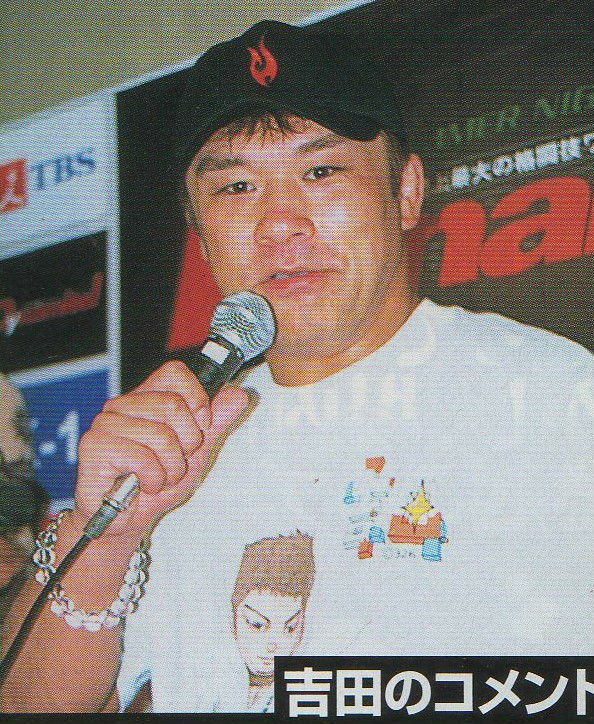 Q: Have you seen Takada's fights so far? Q: What was your impression? Yoshida: Well, whatever kind of fights he is doing, he is a great man. Q: Pride heavy weight champion (Antonio Rodrigo Noguiera) or middle weight champion (Vanderlei Silva) are looking for you. Yoshida: Ah, is that so? Q: Don't you want to fight with them? 1. See Top 13 Classic Historical Myths and Misconceptions about Brazilian Jiu-Jitsu, note 3. 2. Lots of fighters would probably prefer to avoid losing, by being as defensive as possible. But fans don't want to see demonstrations of a fighter's defense no matter how scientific, and promoters don't want to spend money organizing defensive boring fights that fans don't want to see. Fans like offensive action, not demonstrations of defense. Most fighters understand this, which promoters appreciate and are prepared to reward; see interview with Naoto Morishita, for example. This was as true in the 1930's in Brazil as it was in Japan in 2002, as it is in 2016, and as it will always be everywhere. Concerning Brazil in the 1930's, particularly during Helio Gracie's heyday, 1932-1936, see Choque 1. As a side-note, Japanese fans and sportswriters were highly displeased and unimpressed by Teddy Riner's 2016 Olympic gold medal win over Hisayoshi Harasawa. Riner won by having fewer warnings [指導] for defensiveness. See Negative Judo for details. 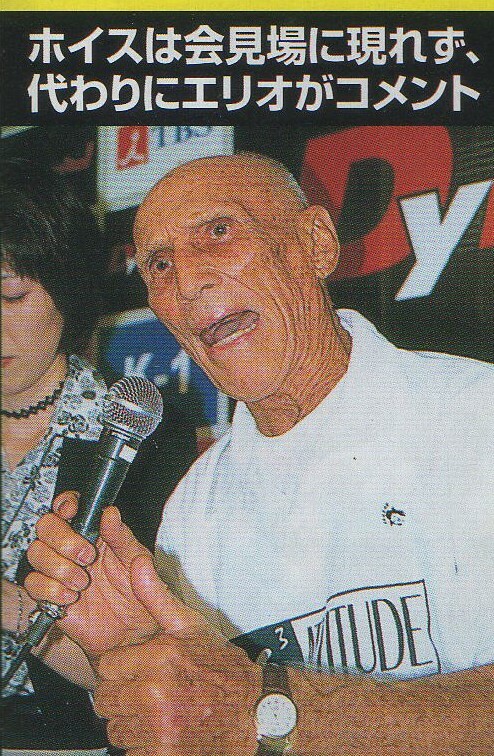 ".....vale tudo-type tournaments have been going on with the Gracie family as a center since 1993. Defeating the Gracies has been a big theme for fighters. So to speak, it is an antagonism structure against Gracie jiu-jitsu. What we have to do is to make a match between Japanese fighter and a real strong fighter, not necessarily a villain, and a match for which the Japanese fan can have empathy like “I want you to defeat him”. "Q: It is said that Rickson asks for a very high pay. Is it true? Morishita: Yes, it is true. He asks not only for money, but also the environment and rules of the fight. Q: Compared to other fighters, does he ask for an extraordinary money? Morishita: Yes. But he is not worthy of it. It is a matter who he is going to fight with. He himself is not worthy at all [Translator's note: in other words, it depends on who Rickson is willing to fight]. However, the situation to ask for a high pay was set up around him. I want him to come into the ring with a hungrier spirit and a samurai spirit as he says, but I can’t feel it from him. I personally think that Royce is much better in this sense." 4. 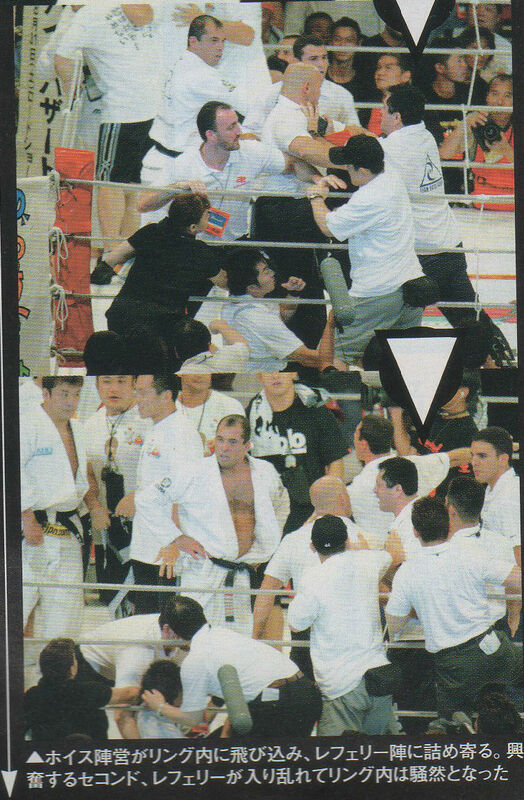 Takada fought Mark Coleman, Mark Kerr, Rickson Gracie, and various others. Some observers suspected that some of his fights were "worked". The fans didn't care, they liked him. The promoters didn't care, the fans liked him. Yoshida is careful to avoid insulting him. *Thanks to veteran MMA translator Yoko Kondo [近藤洋子] for checking the translations and suggesting some improvements. Her translations of interviews with Helio Gracie, Sakuraba, Rickson Gracie, Caol Uno, and many more can be found here].